them to step back and consider what was going on. your community with an eye on the big picture. • What is at the heart of this issue? • Who is at the heart of this issue? • What would be a perfect resolution to this issue? • What part can I play in bringing about that resolution? Look at the optical illusions below. What do you see? Do others see the same things as you? 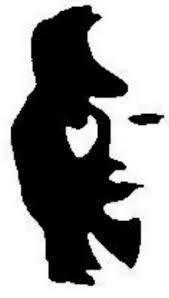 Discuss if you all see the same thing and if not can they see the second thing more clearly once it has been pointed out by someone. Use this as a way into the Matthew Bible reading and seeing things and people differently. 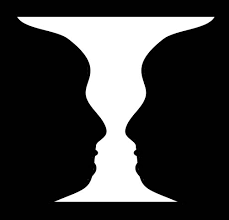 You can also search for more optical illusions online. 40 days of rain on the ark, Jesus’ 40 days in the wilderness, and the 40 days of Lent. Remember the 40s each day of Lent. Between now and Easter each day think of the fact that it would still have been raining on the ark and Jesus would have still been fasting in the wilderness. God saves us from the flood, claims us in baptism, and is with us in the wilderness. That is a good place to start Lent. We are not earning God’s love with disciplines done in fear of failure. We are responding to God’s love by being the very best disciples we can. Click here for a link to a memorization tool that can help you remember the 10 Commandments. Watch the above YouTube clip and reflect: Where am I in this process? What still has to die in me so that God’s Kingdom can grow and bear fruit through me? He is Risen! Go and tell!